Just give me one more chance! Just let me try again! Just let me do that one more time! 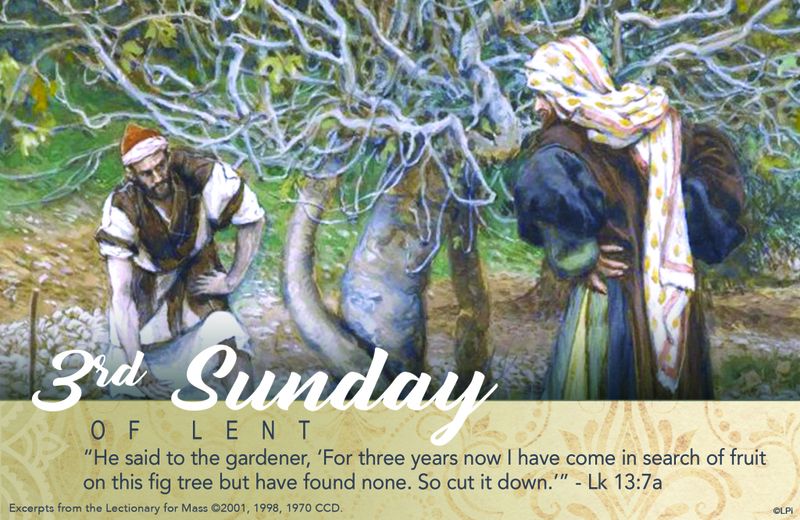 How often we are the fig tree in the parable, hoping another will coax out of us the fruit we have yet to bear! How utterly crucial it is that we be open to the help we are being offered to repent of our sins and bear the fruit of right living! The issue, Jesus tells us, is not that we sin – we inevitably do – but that we refuse to repent, to undergo conversion of heart. God will grant us the time we need to change and will carefully nurture us toward growth and fruitfulness. Nonetheless, the choice to change remains ours and if we refuse, we will perish. We repent when we seek reconciliation with those we’ve hurt. We repent when we turn from dishonesty to integrity both in word and deed. We repent when we replace anger with empathy. Multiple times each day we are faced with choices about turning away from actions that diminish life toward actions that bear the fruit of goodness in ourselves and others. What, this Lent, will our choice be?